If you want to be able to control a 4-axis CNC with grbl and Grbl Controller you will need an Arduino Mega 2560. Be aware that I’ve only added support for it in Grbl Controller, I haven’t actually hooked up a 4th axis yet, other users have done so, however. NOTE: grbl is meant to work on the Uno or equivalent – Don’t spend money unnecessarily on the Mega if you don’t need 4-axis! I’ve moved old info on programming hex files here and updated this page to focus more on Grbl Controller and grbl support on Mega 2560. Our friend Letartare has created some new versions of 4-axis grbl based on various hardware and grbl versions on github. What is important to note is that you no longer have to compile and upload with the AVR tools, instead, he has told the Arduino IDE to compile and upload grbl, which makes working with the files much easier for everyone. Before you begin, I strongly recommend that you are able to build and run a basic Arduino sketch like Blink on the 2560 – this makes sure you have all the drivers installed properly. Copy the desired build, which is a subfolder, i.e. Grbl84Mega2560, into your Arduino 1.0.5x libraries folder. Hi, thank you for your project . I would like to work with yuor new grbl controller 3.4.6 using fourth axis. As i understand after programing Mega 2560 the ports that work with axis X Y Z in controller 3.4.2 are the same . Which port do you use for 4-axle? On the Uno enable is 12 and direction is 13. On the 2560 it is pin 6 and direction is either pin 5 or 36, you need to check the code you are compiling – look in pin_map.h and search for SPINDLE_ENABLE_BIT and SPINDLE_DIRECTION_BIT. In older code it is in config.h. The X axis Lcd was setted “0” right now ,and the X axis has no move.The other axises go home step by step. Unfortunately I don’t know if this version is better than the other version in other parts of the code. This will need to be investigated. where the number should be 4 not 3. There may be other issues in that code. I’ve updated the page to reflect your findings. Thanks! Hello! thanks for excellent tutorial and links! I am rather new to grbl and cnc, but tried your recipe on grbl on mega2560 with “..38400.hex”. 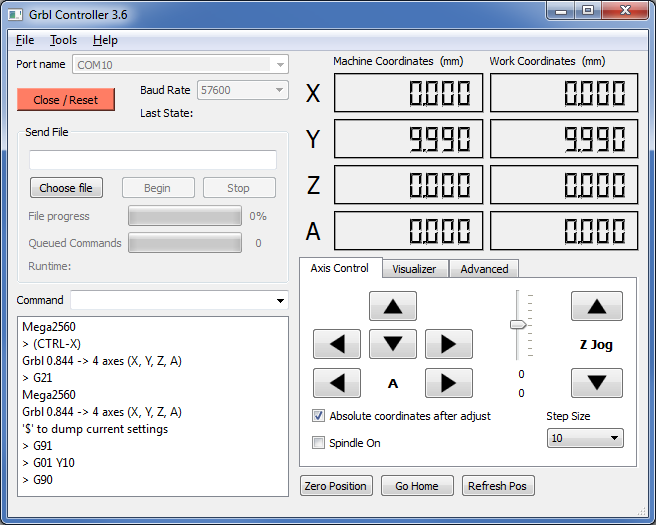 Not sure if it’s really correct, but it at least works and moves all my 3 axes using your grbl controller 3.5. I like it! Video is fine – nice and smooth motions on the Z axis. Glad you got it working. I assume you are eventually going to use 4 axes? Otherwise for only 3 axes you can use a standard Arduino Uno. The only trick was to figure out that for my tb6560 board i had to increase step pulse width from default 30 to 50. Actually i will not use 4th axis, i just had extra mega2560 from my repstrap spares and i don’t have Uno. Well, it works, and i’m really happy i don’t need and lpt-enabled computers or expensive usb-cnc adapters. I am working on getting the fourth axis working on the latest grbl. I will let you know when I have it working again. Hi Guys, great tutorial and the comments are helpfull. I have the following problem using mega2560 and the …38400.hex, I can not get $16 command, ie I can’t activate homing. Any advice would be greatly appreciated! Thanks in advance. What is probably happening is that the original source code that the Mega conversion came from is too old and doesn’t support the homing command. I haven’t checked that site, but maybe homing is supported in that version? Wow thanks for the super fast response Zapmaker! I have used 2 of the lastest conversion forks both from GRBL 0.81 but the problem is the same with both instances. Everything else works just limits & homing have disappeared, I can;t find anyone with the same problem so I must be doing something stupid. I can get homing working with a normal GRBL & Uno system. I have also tested it on a separate MEGA2560 board with the same problem, I use the normal “make clean” then “make hex” commands in command prompt to build the hex file. Any ideas? Hello, that is very good project .I live in china, I want make a 3d printer, so I need 4-axis control, the 4th word is “c”. Could you share you source code about “grbl-081-arduino-mega2560-16u2-38400.hex”? I want make some changer. sorry, my machine 4th word is “A”, you software is “c”. This is a good idea and is being looked at. Not sure when it will be done. This is now fixed. If you can build Grbl Controller from source, you can pull latest from github and build 3.6 which supports A as default 4th axis. See my notes on this page which have been completely rewritten and show you how to install new grbl onto the 2560 that supports A.
I have drastically rewritten this page. See the link near the top which goes to the old page and relates to some of these comments. Does this code work with Arduino 2560 and RAMPS 1.4 ? Does it use the good pin for RAMPS motor drivers and endstop ? no data from COM port after connect. Expecting grbl string. I have not tested the 0.9 versions with Grbl Controller – but if you look at the link above, those versions are for 115200 baud – you are getting a response, which is good, so it may work fine at 115200. To try 57600, you must use the 0.8 versions like Grbl844Mega2560 (found on the link above). The blink code requires you have the arduino code installed on the chip, whereas grbl is installed on the chip replacing the arduino code. It is possible to go back and forth by uploading the appropriate hex file. You need to have the right commands and files to do this. Here’s where it gets interesting – what Letartare has done is taken the source code for grbl and turned it into what looks like an arduino sketch. This means you can upload whatever you want – grbl, blink, etc. from the Arduino IDE. Very cool. Then, your restart the Arduino IDE and go to File | Examples and find Grbl84Mega2560 and pick GrblToMega and open it, then click Upload. This should all succeed – you should see the rx/tx LEDs blink while it is uploading. If you don’t you may have chosen the wrong COM port, etc. Once done, fire up Grbl Controller and open the correct COM port – it should very shortly discover that grbl is running on the Arduino. On the screenshot, the command prompt is due to how I launched it on Linux and won’t show on Windows. To get it working, I uploaded an older version using a command line tool, then connected via Grbl Controller. Once that worked, I went back to the Arduino IDE and uploaded it that way and the new code worked. One thing to note is that Letartare indicated that it is important that only one of the projects be in the libraries folder, thus don’t put Grbl84Mega2560 and Grbl83Mega2560 in there at the same time. To manually upload see my original page now archived at http://zapmaker.org/arduino/programming-hex-file-on-mega2560/mega-2560-original-page/ The command you can try is given below – you’ll need to adjust the path, run it from the command line or batch file in the same folder as the hex file. There is a link to the hex file on the archive page. If that works, then try the Arduino IDE approach immediately after with the new code. Hope this works for you.